The weekend is here!!!! I bet the suspense is killing you.....what did I have for breakfast you ask??? Well....repeat meal offender here: multi grain English muffin with a tablespoon of Barney Butter and 3/4 cup of strawberries. But...I also had a cup of coffee with a couple tablespoons unsweetened vanilla almond milk and splash of sugar free vanilla syrup. Six inch turkey on wheat with everything except olives. (No cheese, no mayo, no oil but LOTS of regular and spicy mustard, vinegar and lots of pepper). 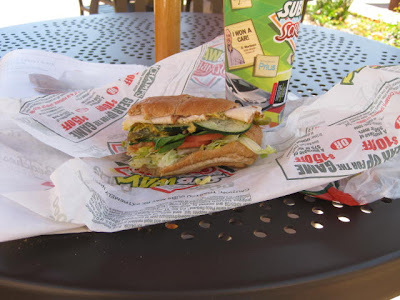 I really love me my Subway. :) I ran a bunch of errands (nothing exciting) and there just so happened to be a Golden Spoon next door to the Trader Joes I was at. Did I plan it that way....maybe. :) I had a small half Cake Batter, half Fudge Brownie. Nam Nam. So there won't be a post tomorrow night (don't cry)...I'm not bringing my laptop with me because I know I won't have any time to post. But stay tuned....hopefully I'll get some good shots of celebrities tomorrow night. Good night all!